Is amusing text your style? If yes, then this shivering, vibrating typeface is for you. The text can be used precisely for messages that need to be portrayed as vibrating slightly or feeling shuddering feverishly. The fear from excitement can also be displayed through this calligraphy. Most writers and designers use this typeface to portray the feeling of congenial sensation of expectancy. 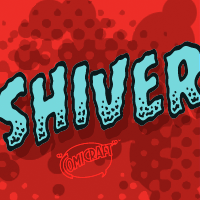 Regardless of the way you wish to use the font, the shiver font will definitely give your project an edge. Comic book readers will be delighted to see this font on their books.